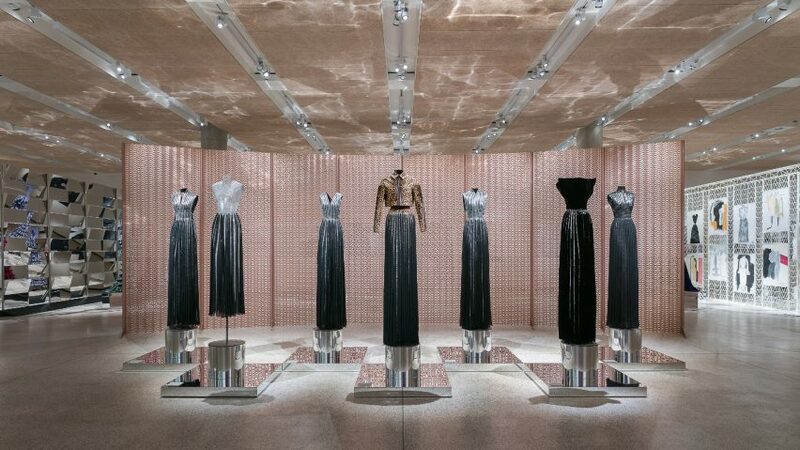 The most significant works of the late couturier Azzedine Alaïa are displayed against backdrops created by designers including the Bouroullec brothers and Marc Newson for an exhibition at London's Design Museum. Azzedine Alaïa: The Couturier is the first UK exhibition of the late fashion designer's work. Conceived and co-curated by Alaïa himself prior to his death in November 2017, the show presents 60 of the Tunisian-born designer's rare and iconic garments, spanning his career from the late 1970s to his very last creations. Among the garments on show at the Design Museum show are his trademark zipped dress, as well as the corset belt and the bandage dress that earned him the title of the "king of cling". His designs have been worn by a famed actors, singers and personalities from Greta Garbo, Grace Jones and Tina Turner, to Naomi Campbell, Lady Gaga and Rihanna. Alaïa's signature "sensuous" and body-hugging garments – described as "second-skin dressing" – are exhibited alongside five custom-made screens by prominent contemporary figures in design and art. Each of the screens were made by friends, collaborators or individuals whose work Alaïa admired, and were all invited to create their own response to the couturier's work. The Bouroullec brothers, Konstantin Grcic, Marc Newson, Kris Ruhs and Alaïa's partner of 60 years, Christoph von Weyhe created screens crafted in metal and glass to frame the garments. "It's not a set design, we wanted the screens to be as much part of the exhibit as the clothes," Design Museum curator Gemma Curtin told Dezeen, who worked alongside lead curator Mark Wilson on the show. A series of photographs taken by artist Richard Wentworth also line the back wall of the main exhibition space. They were taken at the fashion house in Paris where Alaïa worked for over 30 years. As a collector of design, Alaïa had a vision of showing his work alongside those of other established creatives. He was inspired to use London's Design Museum as the home for this vision when visiting the new building after its opening in November 2016. "Because Alaïa trained as a sculptor, he saw putting on an exhibition not as an opportunity to show his clothes, but as an opportunity to present an exhibition," Curtin told Dezeen. "He has elongated many of the clothes, so that it almost creates another function. The function here is not to be worn by a woman, it is to be presented in a gallery setting, much in the way that an artist would do," she continued. Previous exhibitions have seen the couturier's work displayed alongside fine art, but his pieces have never before been shown with design. Each of the screens are used to group the garments under 11 different themes such as Sculptural Tension, which focuses on the designer's use of metal in dress-making. Another section named Other Places, Other Cultures highlights the influence of Africa on the a selection of garments. These themes ignore chronology, and instead focus on the diverse and daring techniques and materials adopted by the designer. "He had a real love of design, and wanted to use design in some way as part of the exhibition," said Curtin. "It's not often that you see two very different fields of creativity – fashion and design – come together. And I think it's really inspiring." Newson created a 10-metre-long screen intended to reflected the anatomy of Alaïa's garments. His pale pink aluminium screen features a series of punctures in a bid to achieve a fabric-like quality. "I designed it so that it looks like a textile itself. There is a strong architectural element to Alaïa’s work, his garments always seem as if they are built rather than sewn," said Newson. Grcic's screen is composed of multiple mirrored tiles, each set at varied angles to reflect different parts of the dresses that stand in front of it. Some of these tiles have spiky and sharp laser-cut edges. "It is intended to be an irritation, something uncomfortable against the beautiful garments. Alaïa wouldn’t have been afraid of this. He too used an off-note, a slight irritation or something unsettling in his creations," said Grcic. Curtin describes these "off-notes" as "little moments of surprise" that toughen up the designs, like a zip or a string of chainmail, or a chunky belt on the back of a delicate lace dress. The exhibition aims to highlight these types of "jaw-dropping" techniques of making that Alaïa was famous for. Azzedine Alaïa: The Couturier continues until 7 October 2018. Photography is by Mark Blower.